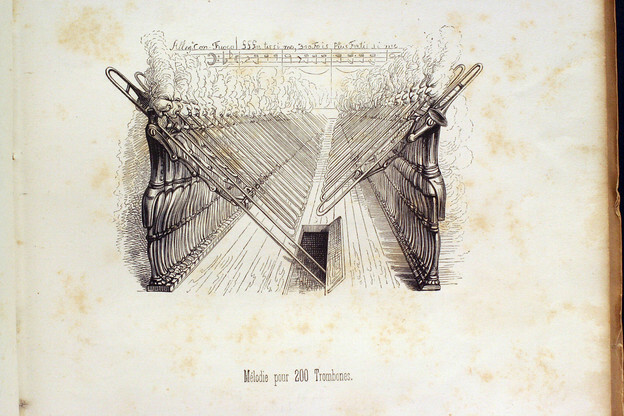 J. J. Grandville, "Mélodie pour 200 Trombones"
Around 1900, technological reproduction not only had reached a standard that permitted it to reproduce all known works of art, profoundly modifying their effect, but it had also captured a place of its own among the artistic processes. Benjamin has in mind here phonography, lithography, photography, and cinema. But, as a quotation from Paul Valéry immediately prior to this passage suggests, these changes––along with those directly bearing on print, such as the rise of the typewriter––affected the way writers like Stein, Valéry, and Benjamin approached the printed book’s already established place among literary processes. “Unpacking My Library” is a work that grapples with the doubleness of the reproduced work: the collector of works seeks the aura of the book, which is only a copy. This doubleness is reinforced by the way Benjamin constructs his essay out of stories of other books. This method of course is central to Benjamin’s collecting practice in Das Passagen-Werk (The Arcades Project). The book functions for Benjamin as both copy and a particular object. Marjorie Perloff has pointed to the similarities between Benjamin’s Arcades Project and contemporary conceptual writing. A key explanation for that similarity, I would like to suggest, lies in Benjamin’s interest in the relationship between mechanical reproduction and the iterability of the book. Benjamin’s insight is similar to Stein’s and anticipates a later, fuller exploration of the literary and artistic possibilities suggested by the relationship between editions, copies, and copying.